auto-changeover unit. The automatic operation allows a continual supply of pressure between two gas bottles, and the second-stage regulator ensures consistent pressure control under varying inlet pressure changes. Check valves are fitted to prevent gas from escaping whilst bottles are replaced. 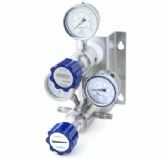 In addition to the features of the previous ACU300, the ACU310 offers a solid disk type main valve assembly.